... All I am saying in this book can be summed up in two words—Trust Children. Nothing could be more simple - or more difficult. Difficult, because to trust children we must trust ourselves - and most of us were taught as children that we could not be trusted. ... It is even possible that some kinds of mental activity may be largely centered in some parts of the brain, and other kinds in others. But it would be simple-minded and silly to say that all the complicated varieties of thought, of mental experience, can be neatly separated into two kinds and that one of these can be exclusively assigned to the left side of the brain, the other to the right. When I say that I am sometimes surprised by what my mind tells me, I am talking about a very common experience. But where in my brain is the "my mind" who does the telling, where the "me" who is surprised? ... What of the fact that often, while thinking of something else, I will find that "my mind" has suddenly presented "me" with a complete sentence, sometimes even two or three, which "I" like so much that I rush to write them down before I forget them? "I" have certainly not produced those sentences in the way I am now producing these sentences on the typewriter, thinking about what words to use or where to put them. On which side of my brain is the producer of these sentences, on which side the observer, critic, editor who judges them to be good? ... It is hardly ever possible to separate what we think about something from how we feel about it ... This notion, now very popular in leading universities, that organisms, including human beings, are nothing but machines, is for me one of the most mistaken, foolish, harmful, and dangerous of all the many bad ideas at large in the world today. If an idea can be evil, this one surely is. ... It is only in the presence of loving, respectful, trusting adults like Millicent Shinn or Glenda Bissex that children will learn all they are capable of learning, or reveal to us what they are learning ... Of two ways of looking at children now growing in fashion—seeing them as monsters of evil who must be beaten into submission, or as little two-legged walking computers whom we can program into geniuses, it is hard to know which is worse, and will do more harm. I write this book to oppose them both. ... How much people can learn at any moment depends on how they feel at that moment about the task and their ability to do the task. When we feel powerful and competent, we leap at difficult tasks. The difficulty does not discourage us; we think, "Sooner or later, I'm going to get this." At other times, we can only think, "I'll never get this, it's too hard for me, I'm never any good at this kind of thing, why do I have to do it," etc. Part of the art of teaching is being able to sense which of these moods learners are in. ... The only good reason for playing games with babies is because we love them, and delight in playing these games with them and in sharing their delight in playing—not because we want someday to get them into college. It is our delight in the baby and the games that make the games fun, and worthwhile and useful for the baby. Take away the delight, and put in it's place some cold-hearted calculation about future I.Q. and SAT scores, and we kill the game, for ourselves and the baby. ... The point is that if it takes a long time to develop a good habit, it will take just as long to develop a bad one. The idea that we must work hundreds of hours to make a good habit, but can make a bad one in a few seconds, is nonsense. And the point of this to us as teachers is that we don't always have to be in such a big hurry to correct children's mistakes. We can afford to give them time to notice and correct them themselves. And the more they do this, the better they will become at doing it, and the less they will need and depend on us to do it for them. ... In this chapter I will say something very simple, that may not often have been said before. Children use fantasy not to get out of, but to get into, the real world. ... 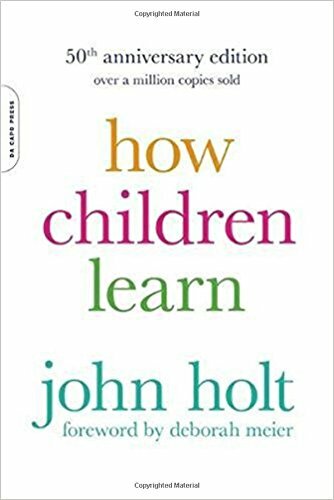 It is a serious mistake to say that, in order to learn, children must first be able to "delay gratification," i.e., must be willing to learn useless and meaningless things on the faint chance that later they may be able to make use of some of them. It is their desire and determination to do real things, not in the future but right now, that gives children the curiosity, energy, determination, and patience to learn all they learn. ... It may be true enough that in learning purely physical skills, such as sports ... we generally have to learn easy movements before we learn hard ones. That is how the body works. But it is not how the mind works ... What makes things easy or hard for our minds has very little to do with how little or how much information they may contain, and everything to do with how interesting they are and, to say it once again, how much sense they make, how connected they seem to reality. ... This book did not change, as I hoped it might, the way schools deal with children. I said, trust them to learn. The schools would not trust them, and even if they had wanted to, the great majority of the public would not have let them. Their reasons boil down to these: (1) Children are no good; they won't learn unless we make them. (2) The world is no good; children must be broken to it. (3) I had to put up with it; why shouldn't they? To people who think this way, I don't know what to say. Telling them about the real learning of real children only makes them cling to their theories about the badness and stupidity of children more stubbornly and angrily than ever. Why do they do this? Because it gives them a license to act like tyrants and to feel like saints.